When Kyle Gass met Jack Black in Los Angeles the mid-90s, neither men knew it would be the first steps on a mission to create the greatest song in the world. 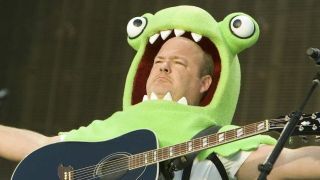 Two decades on, and Tenacious D are the go-to comedy rock duo for anyone who ever wielded a guitar – and there’s the small matter of Hollywood stardom to account for too. My musical awakening came through the rock of the 60s, because I had older brothers. They would play all that stuff. And then rock of the 70s. And then I just sort of petered off after that. There wasn’t really one band, it was more radio. But the first record I bought was between The Beach Boys’ Endless Summer and Sly & The Family Stone’s Greatest Hits. I got The Beach Boys. I was never really in bands. I just really wanted to be an actor, music was a back-up plan. But then in the theatre I do a lot of music. I didn’t have that history of playing, so Jack and me was really the first time I did the band thing. I think the car is the best place to listen to music. You’re in that closed space and you can crank it up. But sometimes I think I’m ruining my hearing, because you go back in the car and turn it on, and it just blares at you. I’m doing damage! I’m probably in the atheist department. I wasn’t really brought up in a religious home. My dad was a lapsed Catholic. My mom was covering all the bases, she got me circumcised. So it’s like, “Mom, you sexually mutilated me?! Just in case? !” She had me baptised. It never seemed that logical to me, it never made that much sense. But I guess we’re still in the minority. America is a religious country, for sure. It’s just part of our fabric. It’s a really big country, there are tons of areas and people. But I do feel like I’m in a Hollywood bubble sometimes where we’re west coast and we’re kind of progressive. You know, a lot of people aren’t. Oh God, the Trumpster fire! It’s a phenomenon like we’ve never seen. I saw Michael Moore on the telly, and he said that it was like working class people throwing a Molotov cocktail into the system. It doesn’t really matter what he’s doing, he’s the change agent for a lot of people who are fed up with the system, rightly or wrongly. But probably rightly. And Trump seems to be that thing, strangely enough. It’s difficult because I don’t think he’s a serious candidate, and I think he could be dangerous. But then on the other hand I’m so entertained my him, and it’s really almost a guilty pleasure. As long as he doesn’t win, it’s the nexus of politics and entertainment. And it seems dangerous to me. We just got through watching Eastbound And Down in the van again, and I think that’s the finest half-hour television show out there. It’s really, really funny. For me it came naturally. I felt I could curry favour with my parents. I was the last of three kids, so I fit that role of the youngest, the class clown. So I kind of cultivated it, I analysed it and thought ‘what is funny?’. There are actually mechanisms, like an acceleration of the truth is usually funny. The truth is always funny. So I learned it and used it in my favour and thought ‘I want to go into that’. You tend to drift into what’s working. When I saw Spinal Tap, that was a really amazing experience for me where they took rock, which I loved, and they did it right. It was inspiring but also they did it so well – cos I was thinking about combining rock and comedy at the time. But they did it perfectly. But then the duo with Jack lent itself perfectly to that. When I was a kid I noticed that people would always ask you what you wanted to be when you grew up. And so the astronaut line for me was acting. But I did some acting early, I was in a school play, I was getting some leads. My breakthrough was in first grade. I played Santa Claus stuck in the chimney. And I was getting some laughs, so I kind of caught the bug. So I thought I’d be an actor. But then the music was there pretty early too. I did loads of theatre in school and then after college. We were called The Actor’s Gang. Tim Robbins was our leader, and we did political theatre. It was a pretty tight tribe for a long time. And then the D took over. What was Tim Robbins like? He’s quite an alpha! He’s a very hard-working, creative guy and he’s a leader and a conquerer, so we followed him. There was a guitar in our house. We had pretty modest means and we had one guitar, the house guitar. I think my dad had given it to my mom as a gift, but she didn’t really take to it. And then the brothers would take it up one at a time. They were all good musicians, but the guitar wasn’t really their thing. I started playing flute and got into that for a while, that was fourth grade. And then the guitar was there and I started playing classical, and I just fell in love with it. And then from then on it’s been an affair! I just love it, the guitar is wonderful. Why d’ya have to hit me with that one? I think I’ve fallen to the American thing of ‘let’s just pretend it’s not going to happen’. But actually the last few years I can definitely feel it happening. You’re not 25, you’re not 35 and you kinda feel it. But I think that it’s good, it sort of defines your life and I’m definitely doing exactly what I wanna do right now. If you’re doing that just one day at a time, and trying to be good to people, you’re doing fine. Just do your best.